Peaceful paddle through a section of the Lower Neponset River, 2004. Over the last 30 years, pollution in the Neponset River has been reduced, the buildings along its shores have been converted to residential and commercial rather than industrial use, and its banks have been improved for recreation. All of these changes have dramatically increased the river’s importance as an aesthetically pleasing backdrop that people can enjoy as they go about their daily business. Without question, any dam removal project changes the appearance of a river, although the change often is not as dramatic as one might imagine. Aesthetic concerns also are the most subjective issue to be evaluated when considering dam removal. Neponset Watershed Association believes that dam removal presents a unique opportunity to enhance the river’s aesthetics. The first and most challenging task in evaluating river aesthetics post-dam removal, is to accurately visualize the change before it occurs. What would a free-flowing Neponset River look like? When a dam is removed, the water levels behind the dam will drop vertically, and in most cases the river will become narrower than the previous mill pond (e.g., the pooled water behind the dam). However, removing the dam does not change the amount of water that flows down the river every day, so although the depth and width of the former impoundment will change, the river continues to flow. Note that the amount by which the depth and width of the river will change depends on the shape of the riverbed, both across its width and along its length. Looking upstream from Adams St. at the Baker Dam on the Neponset River, at Lower Mills. A mill pond typically presents a slow-moving, lake-like appearance. Furthermore, most mill ponds create at least the appearance of a more or less constant depth and width throughout the seasons. By contrast, a free-flowing waterway presents a more dynamic appearance, as the river meanders back and forth as it works its way over or around obstacles. The appearance of a free-flowing river typically varies considerably across the four seasons, as water flow varies from spring snowmelt to summer dry periods. Another critical factor in determining the appearance of a free-flowing river is the slope of the riverbed. The steeper the riverbed, the faster the water moves. Free-flowing rivers with a shallow slope tend to be slower moving, wider, deeper, meandering and marshy, with soft, muddy bottoms. A steeper riverbed translates into faster moving water and a narrower, shallower channel. The faster moving water also tends to scour away fine muddy deposits, leaving behind a streambed of coarse sand, gravel or boulders and producing the proverbial “babbling brook” or even a white-water rapid. Natural processes tend to produce rivers that change character at regular intervals, from upstream to downstream. Rather than being all slow-moving or all rapids, rivers tend to adopt a natural variation with a slow moving “pool” followed by a fast moving “riffle,” and then a smoothly flowing “run.” This pattern is so common that it is referred to as the “riffle, run, pool” pattern. This variation creates visual as well as auditory interest. It also creates a diverse array of micro-habitats that host a tremendous diversity of plant and animal species. Note that in a dam removal context, it is possible to partially control the formation of riffles, runs and pools by intentionally configuring the riverbed. Because dam removal makes the river narrower, it also creates new areas along the river’s edge that will be colonized by a variety of plants, and some of this area may become wetlands. The character of these “new riverbanks” will vary depending on the steepness of the riverbank. In some areas where the riverbanks are very steep, the width of the river will hardly change at all and there will be no new vegetation. More gently sloping areas will tend to be marshy or grassy if they are inundated during much of the year, shrubby if they get flooded at least a few times per year, and wooded in areas that are generally inundated less than every other year. The “new” riverbanks created following a dam removal will re-vegetate rapidly, even without any active replanting. The pattern of vegetation can be controlled by adjusting the shape of the stream channel or by periodic pruning in drier areas. The best way to really understand how these visual changes might play out is to take a tour of the Neponset River as it exists right now, and see with fresh eyes what the river really looks like in areas where it is and is not dammed. Who can see the river now? 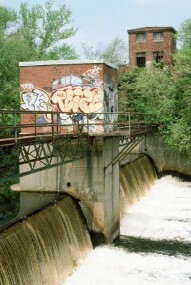 Tileston & Hollingsworth Dam, Neponset River, May 2004. Photo by Tom Palmer. Under existing conditions, there is virtually no visual access to the T&H Dam and very little visual access to its mill pond. Access to the T&H Dam is obstructed by abandoned industrial land and locked gates. The impoundment is largely fenced off, and can be seen only by a few abutting homeowners and from a few locations such as near the Martini Shell Park along Truman Parkway, and where bridges span the river. Because of this limited visual access, there has been no objection to removal of the T&H Dam based on aesthetic concerns. There is significantly more visual access to the Baker Dam and its impoundment. During the winter and early spring, the Baker Dam can be seen by looking upstream from Adams Street, at Lower Mills. However, during the summer, foliage obscures the Baker Dam from view on the Adams St. bridge. 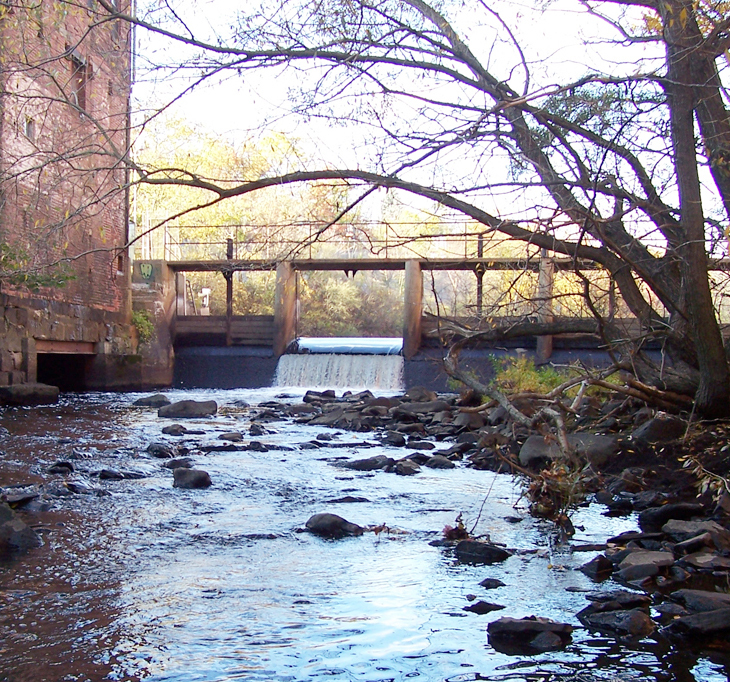 The Baker Dam and its mill pond can be seen from the Neponset Greenway Trail, and the public can approach the dam itself from there. In addition, some units of the Baker Square Condominiums have a view of the mill pond and/or the Baker Dam.